World premiere at Auto China 2018. Continuing the Maybach Success Story. 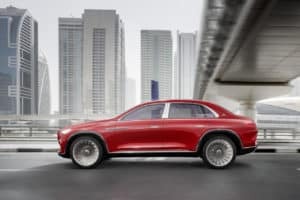 The concept vehicle not only embodies the Mercedes-Maybach design language, it also reflects the traditional brand values while continuing the successful Mercedes-Maybach story. 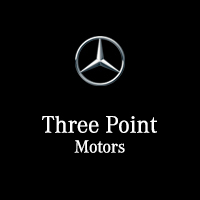 True to the principle of creating “the very best from the very best”, Mercedes-Maybach stands for the ultimate in luxury while uniting the perfection of Mercedes-Benz with the exclusivity of Maybach. The show car also merges influences from the Western and Far Eastern hemispheres to deliver an appealing automotive cultural dialogue. For instance, use is made of “Magic Wood”, ebony, which is traditional in Chinese furniture design. The same motif is also underlined by the combination of SUV and notchback saloon, which are the most successful body styles not only internationally, but especially on the Chinese market. Exterior design: harmony of sensuality and purity. 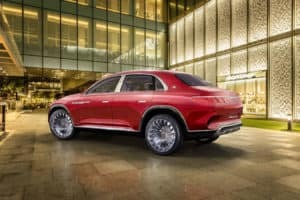 In the Vision Mercedes-Maybach Ultimate Luxury, spaciousness and comfort, in combination with the raised seating position, elegant design and finest materials, particularly in the rear, give rise to a luxury experience at the highest level. The vehicle stands in exemplary manner for the typical Mercedes-Maybach values: traditional craftsmanship, uniqueness and individualisation. Smooth, extravagant surfaces with no beads or sharp edges create an image of sporty elegance: the Vision Mercedes-Maybach Ultimate Luxury has a majestic look. With its balanced proportions, the vehicle has tremendous presence. The front end is accentuated by the distinctive chrome-plated radiator grille with its fine vertical bars in the style of a pinstripe suit. The new grille design celebrated its world premiere in the Vision Mercedes-Maybach 6, the exclusive coupé concept car that delighted aficionados and fans of the brand in 2016. It also inspired the latest reinterpretation for the Mercedes-Maybach S‑Class.